On Friday we ran a poll asking Would You Allow Google to Manage Your AdWords Account? I am honestly not surprised by the answer, where an overwhelming majority of the responses were basically, "no way!" In short, people feel that the Google AdWords representatives who manage accounts in Google for advertisers cannot do as good as a job as an SEM company or someone who manages it themselves. 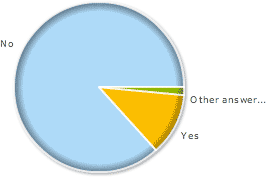 Just take a look at the pie chart, 87% said no, they would not allow Google to manage their AdWords campaigns. That is out of about 150 responses from our readers. The other responses said that they would allow Google do the set up of the initial campaign but then take it over from that point going forward. In my mind, that means, no, they won't allow Google to manage their campaign. What does this say for Google? But what I find interesting is that I would have to guess that a nice percentage of Google AdWords campaigns are managed with Google employees. What does that say for those who pay for those campaigns? Previous story: Google, How Are "Business Web Design" & "Semi Repair" Related Keywords?